I drank this. I feel ten feet tall and jedi proof. 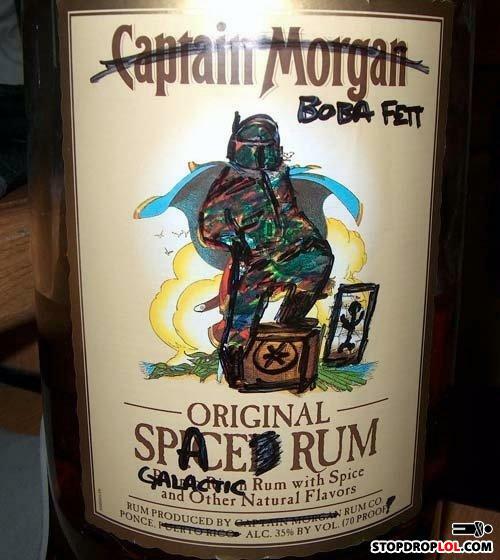 Despite his crude marketing, Fett managed to control the Space Rum Empire after murdering Captain Morgan. my captcha was written by MC hammer "hammer time"
Gotta little Fett In you? "You know how it happened right? After Jango got brutally decapitated, poor boba couldn't find anybody to blame but himself." "dude that makes no f*cking sense at all." "Oh yeah? Well you come up with something better, assh*le." Where dat group of black boys at? 'Cuz DAAAAAAAAAAAAAAAAAAAAAAAAAAMN!